Is there any such thing as a "giant scale" boat? I can't seem to find much information on the bigger stuff. Our airplane club has an annual "boat float" and I'd like to build something impressive, not like the toys that the other guys bring. The lake can get pretty windy/choppy, too, so bigger is better in my case. I'd like something "scale like" (not too detailed, but recognizeable), and it has to be electric. Would a pair of automotive batteries and a trolling motor work? Where can I find plans/photos and/or other information about bigger boats? Glad to hear you have crossed over to the "dark side" of R/C.....lol Well, to answer your question no, there is no such thing as "giant scale" per se. However, with that being said, there are a miriad of ship kits available that are quite large and would impress your friends. If you are looking for a tugboat type I do business with Harbor Models in California. http://www.harbormodels.com They have some very nice kits available and some of the tugs are quite large I am a big fan of the "Invader" class tug they have for sale. Its around 51" long and powerful enough to pull the dock away from shore. Another kit that comes to mind is the Mr. Darby by Dumas. This boat is also available from Harbor Models. I have built three fo them in the past and am currently working on my fourth. Powered correctly they are very good performers. If, on the other hand you are looking for a warship type ship, Loyalhanna Dockyard http://www.loyalhannadockyard.com/ comes to mind. They have a large selection of ships & fittings to keep you busy. A word of caution though, the larger (1/96th) warships typically are in the $1000.00's to build. Last but certainly not least, if you are looking for a gas powered boat, Warehouse Hobbies sells some dandy ones. Tony C. is a great guy and I have bought multiple boats from him in the past. Obviously, he is not the only one. Aeromarine, Hoover Hydros are but just a couple of the companies producing fine boats. I would suggest that you just do a Google search and see what tickles your fancy. If you need any more questions asked we are here to help! Ummmmmmmm................I was thinking of something a little more "ambitious"! It needs to be small enough to fit in a 5x8 cargo trailer (90 inches or less). This will be a decidedly "low tech" (and low cost) project. I plan to cut/shape foam for the hull and cover it with glass. An aircraft carrier would be ideal because the hull wouldn't be too complex and the top is flat with a small tower and minimal detail. I want to use 12V automotive or marine batteries because they've got a ton of capacity, are inexpensive, and are heavy enough to sit the boat down in the water. I won't go crazy on detail; it just has to be BIG and recognizeable as a carrier (or whatever I decide to build). It doesn't have to be fast, either: big, slow, and menacing is what I'm after. I've got too many other projects going to make this one a multi-year ordeal, so it'll have to be as simple as possible. I figure a weekend or so of gluing big blocks of foam together (for which I already have a supplier) and some quick work with a hot wire cutter will enable me to rough out a hull with minimal effort. Sand/shape/fill/glass and I'm on my way! Topside detail will be "standoff scale" quality and not fancy. This will not be a museum-quality piece, just big and fun. This is what happened when I decided to build a rocket (pictured here with my son)........! Yes, it flew (for a little while), though more like a cruise missile than a rocket. Yikes! Has this kind of thing been done before? Your imagination is your only limitation. An carrier wouldn't be too ambitious depending on just how detailed you want to make it. I think I'd give the trolling motor idea a 're-thinking' though. Lots of power if your model weighs a ton, but more power than you'd -ever- need for most R/C models. Got an old 'F4F' laying around? Fold the wings, put the pilot on the nose with a pair of oars (so my imagination isn't exactly the best). Another thing to watch out for is 'un-sealed' batteries. The gasses they give off can really do a job on a model (acidic). They do make for good ballast though. Whatever you decide, have fun. Post pictures! Oooohhhhhhh...........great advice about using sealed batteries. Hadn't thought of that. Moozie picked up an old RN recruiting prop and runs it. It is more of a hands on thing rather than RC though. 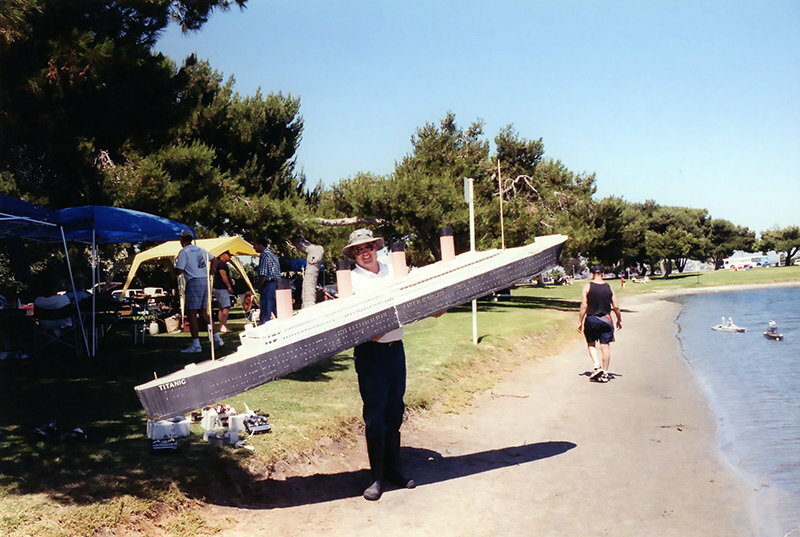 Our club builds 6-8 foot ships regularly, and is working on some 12 foot battleships. A Great Lakes club build 12 foot "Lakers" used for hauling around cargo. Have a look around Modelwarships Underway's web site. A shot of three of the 8 foot Heavy cruisers and small destroyers in our club. And one of those 8 foot cruisers sailing past a previously shelled island target during a game. More great ideas! I love the big sub with the flat-bottomed hull and shallow (2") draught. Since I'm not in this for ultimate scale realism it would probably be easier to build a flat hull and only worry about what sticks up above the waterline. I'm only concerned about what they'll see above water, anyway! P.S. what's a "trawl motor"? That's what the post said was used to steer the sub instead of a rudder. I've got some questions about "waterline". It appears that the bigger boats need a lot of ballast in order to sit down in the water properly, regardless of how heavy they are. Does this make them more stable? If I run a flat-bottomed hull (instead of full depth) and run only a few inches down, will my boat be unstable? (Tip over?). I want to go the easiest route but I want it to work. I don't care what it looks like out of the water; I only want it to look real from the water up. Is this flat hull a bad idea? The largest scale ship that I've seen was 14 feet long. It wasn't done but had all of the running gear installed. He had it powered by 2 power seat motors from a Volare' to give you an idea of how long ago it was when I saw it. The owner was giving a ride to a 98 pound boy to see how much more ballast that he'd need. For long run times and if you plan on using something like Minn-Kota's for power then I'd look into deep-cycle batteries. They're heavy at around 70-80 pounds and you would get a lot of run time out of them plus enough to run accessories. My interest is large scale boats, I have built many large sail boats, actual 2 meter boats. I am now working on a 3 meter r/c sailboat. The mast must be 15' foot tall. I am just starting to build the hull. Over 9 foot long and about 18" wide, long and sleek. It will be a fast boat. I even have solar panel to recharge the batteries. I may have a blog of it up soon. Attached is a picture of a large scale boat. I have built a 8' scale WW II PTB. All the parts are 1/8" plywood. Fir was used for all the framing that does not show. I used Birch with 1 very good side for all the surfaces that show. It runs on a car battery & a Minkota 41 pound thrust trolling motor. The motor powers 2 SS driveshafts in SS 1/4" bearings. There is a SS thrust bearing at each end of each shaft. The shafts are driven by timing gears and a timing belt. Props are each 5 bladed, bronze, 5.5" X 5.5" of pitch. 120 watt dual channel amplifier with 8 BIG GM car speakers. 2 seperate RAM engine sound modules that increase volume as the rpms incease. ...........Sounds loud with ear plugs. Very realistic operation. Scale of boat is 1/10. HAS A FULL CREW ON DECK. Boat is set up as a " Barge Buster " with loads of 20 mm & 37 mm deck guns. Ballested to the water line, it weighs 80 pounds. I normally run it at 50 pounds. I had Staples enlarge the 30" plans to 96"
Big models CAN be done relativly cheaply. Attached is a picture of a large scale boat. Where in Cali are you? Rich, did you get my pm? I also posted on your page as well. 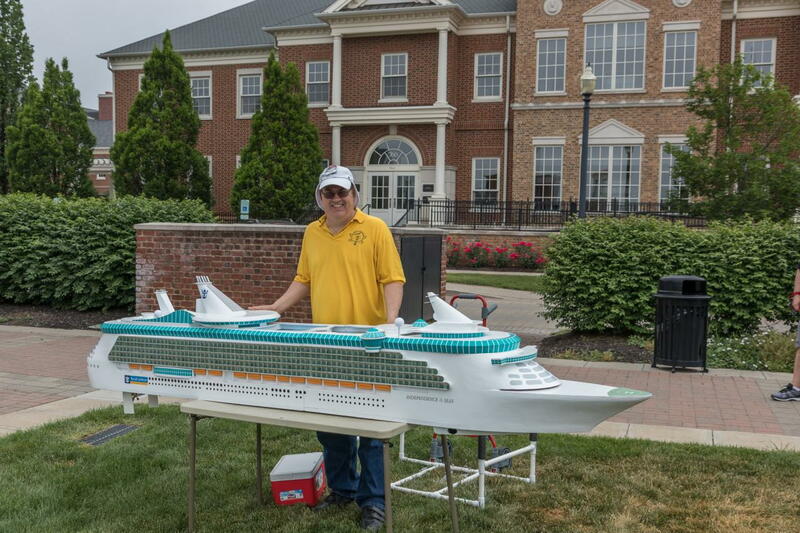 Here's a shot of my cruise ship, Independence of the Seas, built out of foam. LOA: 10' Weight: 18lbs with battery. Build time 2 months. Construction is 3/4" insulation foam, foam board. Last edited by Boeing314; 01-27-2019 at 09:25 PM. This is old (2000) but this was my first foray into foam modelling with a 12' titanic. All hot wired white foam. Less than 20lb overall weight.